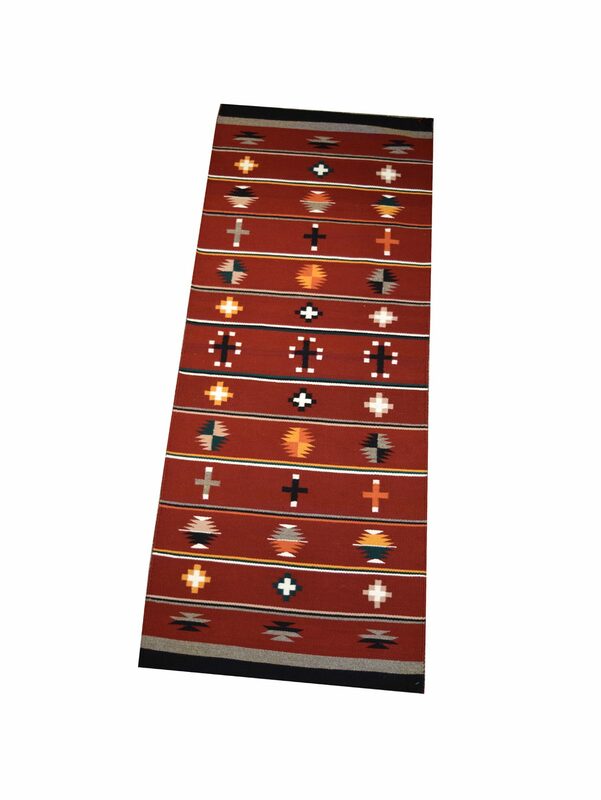 This Pictorial Revival Contemporary Navajo Weaving is by Navajo weaver, Nathan Harry. The weaving measures 18″ x 23″ and can either be a rug or a wall hanging. 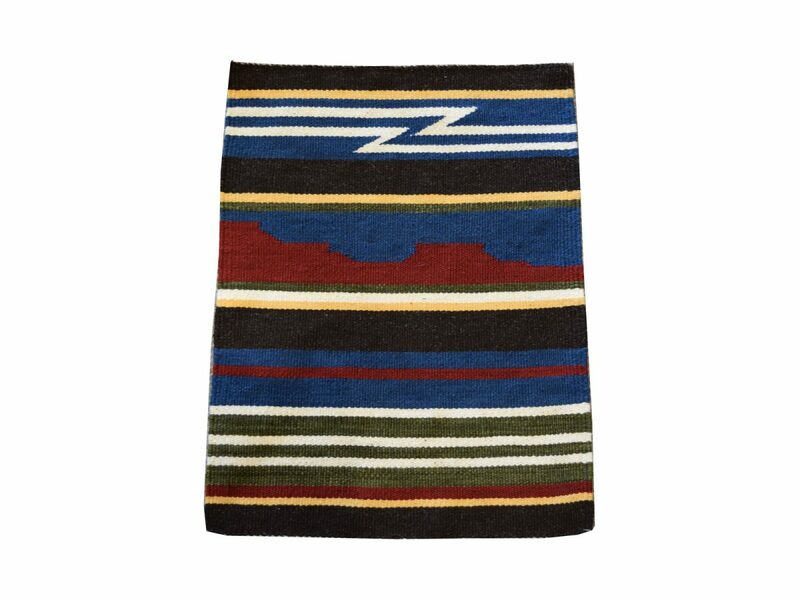 A Pictorial rug portrays a bit of Navajo reality; a woven journal of the features of a weaver’s daily life. Many Pictorials are landscapes with a hogan, a corral and pickup truck, a woman in a long skirt. Sheep, cattle, and horses are often shown, too. The landscape usually includes rock formations, trees, ponds, and clouds. Railroad trains, panel trucks emblazoned with soft drink logos, and even aircraft also show up on pictorials. Pictorial rugs are woven in colors appropriate to the subject matter – blue skies, green junipers, black or white sheep. Borders, if any, are usually dark. Many Pictorials are still woven without perspective or shading, but some weavers are producing some surprisingly realistic pictures, considering the medium. Occasionally, a weaver will make a replica of a flag, or weave a motto such as “Home Sweet Home”. Though technically Pictorials, these usually are referred to as “specialty rugs”. Sometimes I usually weave all day and herd sheep and help around the house and chopping wood…It seem like every time you look up there is a jet plane. A combination of factors helped revive the Navajo weaving industry: continued demand for a good quality rug and the contribution of several farsighted people. Several people in different areas began experimenting with vegetable dyes and vegetable-toned chemical dyes. The success of Leon McSparron and Mary Wheelright at Chinle gave not only new, softer, pastel hues to the rugs but also a new design with patterns set in bands on a borderless rug. Mrs. William Lippincott of Wide Ruins did the same with similarly outstanding results. The open, unbordered styles also pleased the Navajo weavers. The DuPont Chemical Company experimented with developing a wider range of colors. This effort was extended even further by the Diamond Dye Company, which introduced a series of dyes called “Old Navajo.” Now the weaver had, in one package, both the mordant and the colorant. This process was faster and less dangerous than the old mixing with acids, and it produced more uniform results. In 1934, the U.S. Department of Agriculture established the Navajo Sheep Breeding Laboratory at Ft. Wingate (near Gallup, New Mexico). Here, they developed a breed of sheep combining the high mutton-producing qualities of the Rambouillet with the better wool qualities of other breeds. The lovely, long, staple wool of the 19th century Churro sheep was, however, a thing of the past.